Lung disease experts are calling for a new national system to identify lungs for transplant which could double the number of procedures across the UK. In a report from the Cystic Fibrosis Trust, they say lungs should be matched with those most in need, regardless of where they live. A third of cystic fibrosis patients die waiting for a transplant in the UK. NHS Blood and Transplant says it is reviewing its approach to allocating donor lungs. At present, in the UK, there is no national system for giving donor lungs to the most urgent patients. Instead, suitable lungs from a donor are allocated to the closest regional transplant centre where doctors decide who is the best candidate for the transplant procedure. If no suitable candidate is found, the donor lung is offered to the next transplant centre in the region. Ideally, patients should receive the transplanted lungs within eight hours. Cystic fibrosis is the third most common reason for lung transplantation (16.8%) and has the best survival rate of 60% five years after the procedure. But, of the 10,000 people with the disease in the UK, only half survive past their 40th birthday. For many, a lung transplant is their only hope of survival. The report, entitled Hope For More - Improving Access to Lung Transplantation and Care For People With Cystic Fibrosis, made 13 recommendations on how to increase the number of transplants for people with cystic fibrosis and improve the quality of care they receive. An increase in the supply of lungs by making a change to organ donation law to move to a system of "presumed consent"
The report said too many young adults, teenagers and children were dying on lung transplant waiting lists. "We believe that a national system of allocation should be implemented. Where an individual lives in the UK should have no impact on the likelihood of receiving a lung transplant. "It is essential to implement a system for allocating lungs to potential recipients that minimises disparities in waiting time between individuals with comparable risk of death, and similar medical, geographic and demographic characteristics." The report also said the lung allocation system should be made "more fair and equitable". The report was produced after consulting transplant clinicians and surgeons, organ donor co-ordinators and patients on how the rate of successful lung transplantation could be increased. The CF Trust received 140 responses in total. Single mother Robyn Davidson has cystic fibrosis and is waiting for a lung transplant. She told BBC Radio 5 live of the challenges this posed, like getting out of breath doing everyday tasks and having daily treatment to stay healthy. "A successful lung transplant would mean that hopefully I would have as healthy lungs as anybody else my age, which would be something I have never had," she said. "It would be absolutely fantastic." Under the current system, the search for a suitable pair of lungs is restricted to the South of England, where she lives. 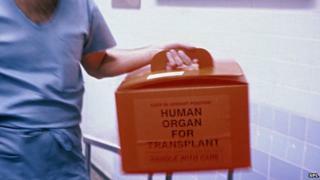 If a transplant became available somewhere else it could be wasted, she said. Asked about being on the waiting list, she added: "You just don't know. "My call could come today, or it might not come for another year or more and you just have to be ready to go when the call comes through." NHS Blood and Transplant, which is responsible for managing the UK's National Transplant Database, said it welcomed the report from the Cystic Fibrosis Trust. James Neuberger, associate medical director for Organ Donation and Transplantation at NHS Blood and Transplant, said lung transplants were particularly complex. "Assessing donor lungs and selecting the most appropriate recipients is often difficult and needs detailed knowledge of the recipient. "The transplant surgeon will use their clinical knowledge to assess both the donor lungs and potential recipients to find the best match, based on aspects like the risks associated with the lungs and the severity of the patient's condition." He added: "We are reviewing this approach to ensure that it delivers the best patient outcomes and if other approaches offer advantages to patients, we will make the necessary changes." NHSBT said it was looking at creating a super-urgent waiting list for lungs. A Department of Health spokesman confirmed that the current system was under review. "A panel of experts is currently looking at improving the allocation of donated lungs to make sure the system is efficient and equitable for patients across the UK," he said.